Over twelve life-changing months our program will transform you into a versatile and well-rounded Makeup Artist, ready to enter the competitive global industry. Under the mentorship of our award-winning instructors you will take a step-by-step journey of the makeup world, developing a broad set of tools and techniques. You’ll learn the business inside out and discover the thrilling, challenging, messy and infinitely rewarding creative process. As you grow as an artist and discover your own voice, you’ll develop the confidence and creativity to become a successful makeup professional. Our industry-forward curriculum is recognized the world over as a leader in Makeup education, and our Global Makeup Program is a benchmark for excellence. With no stone left unturned, our expert instructors will equip you with the most comprehensive makeup training possible – from Beauty and Bridal makeup, Cosmetic Retailing, Hairstyling, and Makeup for Fashion to TV and Film, Airbrushing, Special Effects, Prosthetics and Digital Makeup. Moving beyond theory, you’ll gain countless hours of practical experience. We’ll immerse you in real-life makeup environments, from behind-the-scenes retail and fashion shows to live demos, competition platforms, masterclasses with makeup superstars and more. You’ll take part in a series of professional photo shoots, capturing your work in an industry-standard Portfolio. Watch as your classroom extends beyond the walls, and your education encompasses the wider makeup community. Flourish under the leadership of our award-winning, expert faculty. Rub shoulders with the Makeup elite and form a network of professional relationships. Benefit from the lifetime support of our dedicated Careers Department and seize industry opportunities – all before you graduate. ​As you develop your techniques and confidence, you’ll grow into your role as a makeup artist, learning to harness the tools and technology of the trade to market yourself and your brand. Any successful makeup artist knows that professionalism and communication are just as important as your technical and artistic abilities. That’s why we dedicate so much time to helping you develop confidence, maximise your professional potential and hone your communication skills. We do more than teach you how to perform great makeup. We prepare you to become an industry professional. They’re winning Emmy Awards and creating looks at global Fashion Weeks. They’re jetsetting from blockbuster film sets to exclusive red carpet events, gracing the covers of Vogue magazine and commanding makeup and special effects departments on major TV shows. They’re our grads, and they’re leading lights of the makeup world. From Andrea Tiller, personal Makeup Artist for Amy Schumer, to celebrity groomer Kumi Craig – who works with the hottest A-Listers from Leonardo Dicaprio to Jay Z – we have thousands of successful makeup alumni. Our graduates consistently rise to the top of the makeup business, bringing their artistry to every corner of the industry, garnering international recognition and making us proud. We want you to reach these same heights. So we have lovingly crafted Programs that will train you for the industry, coach you in professionalism, and prepare you for a successful career in Makeup once you graduate. Over the years we have developed a global network that connects us – and our students – with luminaries of the makeup world. As part of our commitment to exceptional education, we invite these makeup masters to share their expertise and experience in exclusive seminars, presentations and demos, just for our students. Past events have featured Oscar winners Ve Neill, Bill Corso, Howard Berger and Tami Lane; multiple Emmy winners Eve Pearl, Thomas Suprenant and Todd McIntosh, our Makeup Department Director; celebrity Makeup Artists Sharon Gault, James Vincent and Siån Richards; Fashion superstars Janeen Witherspoon and Ayami Nishimura; and Makeup visionaries Maurice Stein, Roque Cozette and Dany Sanz, founder of MAKE UP FOR EVER -, among others. As a Blanche Macdonald Student you will have the unique opportunity to learn from – and rub shoulders with – the makeup elite. From exclusive internships to onsite employment fairs and industry partnerships, your success is our business. That’s why we have a dedicated Careers Team focused 24/7 on career placement. Their vast network of industry contacts, top employers, powerhouse brands and exclusive agencies know that Blanche Macdonald is the first port of call for anyone seeking makeup talent. Our Career Directors offer their lifelong support and one-on-one attention to help you find employment and opportunities – whether it’s the day you start, the day you graduate, or anytime from now to forever. As a graduate you are part of a global network, connecting you not just to top brands, experts and employers, but also to your fellow students. Our grads hire each other, partner up, put each other forward, inspire and support one another. Your classmates today will be your colleagues, collaborators and co-creators tomorrow, the first – and often most important – links in your own professional network. This is the unbroken circle of the Blanche Macdonald family. Our Makeup School is strategically placed at the epicentre of Hollywood North. Whether it’s hit TV series like Riverdale, Once Upon A Time, Supernatural or A Series of Unfortunate Events or blockbuster feature films Deadpool 2, Wonder, Star Trek Beyond and countless others, run the credits and you’ll find a Blanche Macdonald graduate. With hundreds of TV shows, films and commercials being produced every year, Vancouver’s TV and Film business is now worth over $2 billion – and growing. Blanche Macdonald’s coveted location, coupled with our industry connections, gives our students potential access to endless opportunities right on our doorstep. Our expert instructors are often arriving to class directly from set, where they are key makeup artists and department heads on a wide range of productions. Just by being a student at Blanche Macdonald you are instantly connected to the vast network of active makeup artists working in TV and Film. This is your all-access pass to Hollywood North and beyond. Your Makeup Kit is your artist’s palette, your creative arsenal and your best friend. On your first day of class you’ll receive a ZUCA makeup kit – widely considered to be the industry standard – loaded with the best of the best, giving you the chance to work with the hottest brands on the planet, including MAKE UP FOR EVER, MAC, Cinema Secrets, Kryolan, Premiere Products and many more. You’ll also work with the industry’s best tools, including Morphe Brushes, Beauty Blender and top-of-the-line IWATA airbrush and compressor, the trusted brand of Oscar and Emmy award winners. And then there is your student discount and ongoing student workshops at our Pro store CurliQue Beauty, where you will be given access to thousands of products including Kevyn Aucoin, ILIA, Cozzette, Eve Pearl, Lit Cosmetics, Velour Lashes, Love for Lashes, Rituel De Fille, RCMA, Sappho New Paradigm, Senna Cosmetics, Stila, The Ordinary, Dermalogica, Eminence, Oribe and the list goes on. As a student, being able to actually play, experiment, learn and create with thousands of makeup products is critical to your education and to your career. When you know which product creates which effect, or provides a certain sheen or texture, or is paraben free or organic, this knowledge expands your creative repertoire and your ability to meet the needs of your client. All makeup artists begin with a good foundation. In this introductory level you will develop a solid base of skills and knowledge to build upon throughout the program. Face shape, eyes, brows and lips take centre stage as you learn the essentials of makeup application and explore colour, texture and light. Learn to care for the skin and work with different skin types, tones, ages and ethnic groups. Develop techniques for blending, contouring, shading and highlighting through practical applications in classic, natural, glamour, bridal, mature and dramatic styles. Learn industry standards for cleaning and hygiene and develop hands-on product knowledge direct from industry pros at CurliQue, our Beauty Boutique. Many professional Makeup Artists begin their careers in retail. Learn the language of the retail realm, including merchandising and cosmetic store standards, marketing and trend cycles for cosmetics and fragrances, and the essentials of “counter culture”. Develop techniques for selling and marketing, identifying consumer behaviour and building a loyal clientele. At CurliQue, our Pro Beauty Boutique, you will experience behind-the-scenes retail first hand and have exclusive access to a vast range of professional products. Our CurliQue Talent Team will guide you through their winning “The Art of the Sale” technique and coach you on sales and customer care. Real experience, in real time. With essential hairstyling skills you can create a total look from head to toe and offer a complete professional package for weddings and the fashion industry. Guided by an industry expert, learn styling techniques including backcombing and finishing, simple braiding, fingerwave setting, pincurling and rolling. Wielding the blow dryer, flat iron and curling iron, you’ll learn how to create updos including the French Twist, French roll, Spanish bun, side chignon and high bun, as well as a range of vintage looks and contemporary styles. 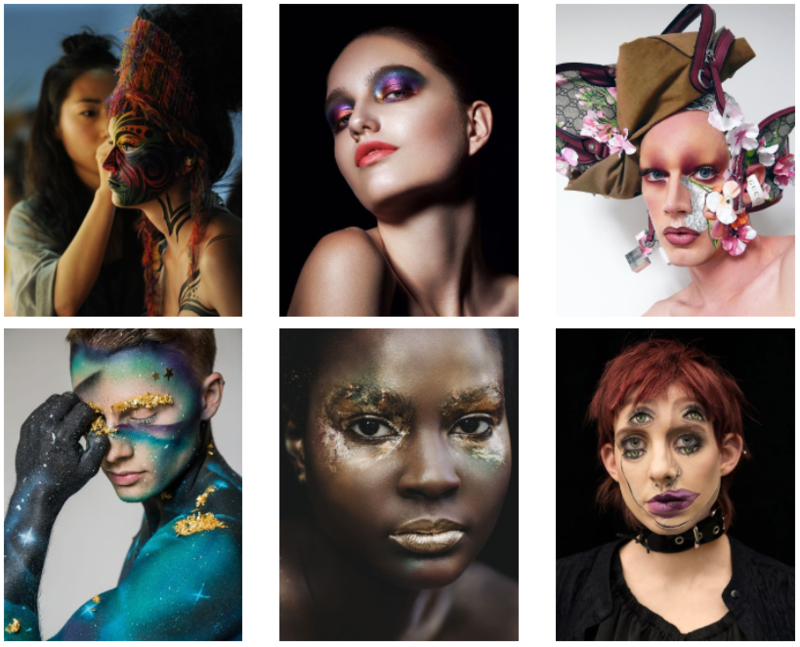 Learn how capture your work through effective photography and create eye-commanding visuals to project your makeup talent in the digital realm. With a professional photographer as your guide, you will execute an industry-standard photoshoot. Discover how to maximize your digital camera to produce high quality results, select effective backdrops and lighting, and learn the essentials of photoshoot etiquette. You will produce industry standard shots of your work, receive professional feedback from a photographer, and learn first-hand the relationship between makeup and photography. We’ll identify the key features of a great portfolio and help you choose your personal design elements to create your own winning portfolio. Fashion Makeup Artists create trends and change the face of the fashion world. In this exploration of historical, contemporary and futuristic fashion makeup we will analyze the trend cycle, examine current makeup fashions and trends, and identify makeup eras of the 20th century. You will create face charts and perform practical applications for runway and fashion show looks, model tests and actor headshots. Explore the contrasts between black and white; street and alternative; real and camouflage. Working with a creative team – hairstylist, fashion stylist, photographer and model – you will collaborate on an artistic vision, designing a makeup look to work with a stylist, photographer or designer’s “big picture”. Learn the role of a Makeup Artist in the context of runway and print environments and develop etiquette for working with a production team, client, agency or art director. In this hands-on career-coaching intensive, we’ll help you polish your professional style and create a personal marketing strategy. Develop the critical tools and confidence to network, build relationships, and identify and communicate with prospective employers. Learn how to perform a job search, speak publicly, write a standout cover letter, produce an industry CV and conduct a winning interview. It’s like bootcamp for your professional image. In this level the body becomes a canvas for the realization of your creativity and imagination. Learn the safety and mechanical considerations of airbrushing and how to efficiently clean, assemble and load an airbrush. Create character charts for airbrushing; experiment with patterns and textures; learn to use masks, shields, templates and friskets. Guided by your expert instructor, discover how to use the airbrush to cover tattoos and skin discolourations. As your techniques are refined, you will perform airbrush applications on hair, and create and apply airbrush tattoos. Explore makeup’s transformative power as you design, develop and apply makeup to bring characters from script to screen. Learn the techniques to age, pigment, camouflage and texture the skin and depict hair growth. Manifest a character’s breakdown by producing the effects of tears, dirt, perspiration, road rash and drawn cuts. Discover how to read a script as a Makeup Artist as we uncover the essentials of an on-set professional – creating script breakdowns, preparing and executing a continuity chart, reading a call sheet, and working within professional time and budget restraints. We’ll get you set ready by exploring the professional requirements of the TV and Film industry, including commercial product knowledge, lighting for stage, TV and film, makeup kits and maintenance, union procedures, and roles and responsibilities on the production set. Make your character’s transformation complete by mastering hairstyling techniques for Stage, TV and Film. Learn how to wrap hair for precision bald cap and wig cap wrap applications, and groom and trim beards, moustaches and sideburns. Let your creativity run wild as you design and execute your own unique, avant garde hair creation. Learn the expectations and etiquette of an on-set stylist, including the importance of maintaining continuity and working within industry standards. Enhance your digital skills on this step by step journey through the process of cutting-edge character creation, from research and development to practical application. Learn techniques for digital character design and advanced Photoshop image handling techniques for Makeup correction. We’ll explore the professional ethics of digital makeup and learn how to effectively collaborate with Directors, Producers, Actors and other film departments including Costume and Hair. Research and pull images for use in Character Design to create your very own finished character. Fantasy becomes reality as you take your art of storytelling to the next level. Learn to produce realistic manifestations of trauma with scars, bullet holes, lacerations, bruises, scabs, cuts, blisters, burns and black eyes. Use latex, silicones and gels to create texture, colour and contour, create and apply your own bald cap, and lay beards with crepe hair. Refine your industry savvy as you prepare and execute continuity charts and learn the budget and time limitations for special effects makeup. Identify and correctly label the anatomical structure of the face, and analyze and compare professional products and their uses. Applying all you have learned, you will conceive and create a complete special effect makeup for a scripted character, bringing your vision to life. Life cast, paint, sculpt and amaze as you develop the technical tools to design and construct your own fantastical creatures. Explore the safety and health factors when using prosthetics and learn how to correctly prepare a model for prosthetic application. Design detailed character charts and overlays, sculpt your own mould and create a life cast of the face to the neck to produce your prosthetic appliance. Apply your prosthetic to your live model, bringing your character from conception to fully-realized flesh and blood. Your creation will be captured in a professional photo shoot – a powerful addition to your growing portfolio. Hone your creative aptitude and refine your technical abilities as you integrate all of the skills, techniques and knowledge you have developed throughout the program. This is your opportunity to create a makeup masterpiece from conception to realization. 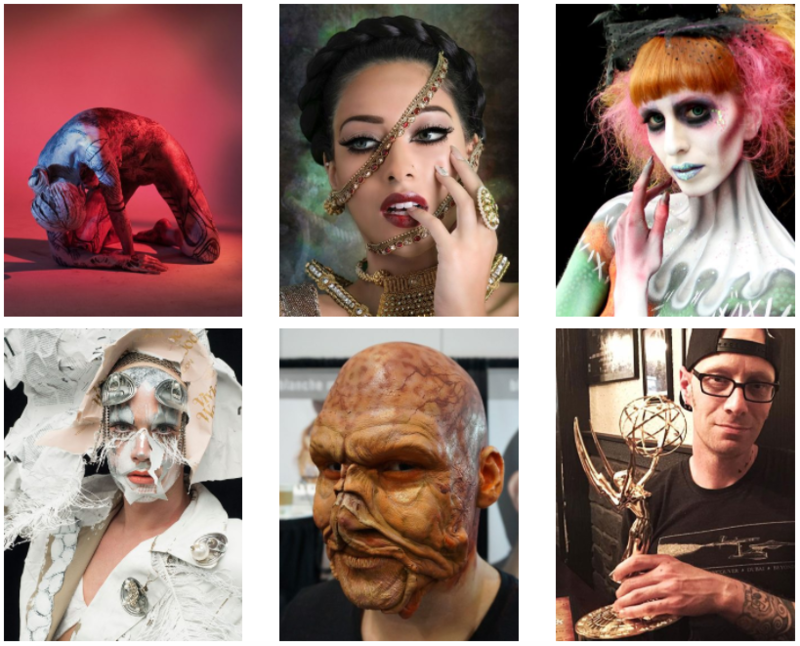 Drawing from a palette of inspiration and reference material, you will develop a character board and create a makeup concept from a specific industry discipline for a photo shoot. Use your extensive repertoire of makeup skills to bring that character from pen and paper to flesh and blood in dazzling 3D glory. At the interface of technique and technology, successful makeup careers are realized. In this level we will help you develop the digital and visual tools to to market yourself as a Makeup Professional. Learn to optimize your images on Photoshop, using tools for manipulating, formatting, retouching and synthesizing your work. Produce a multimedia presentation with finished images and music, and create a personalized business card. Learn how to produce a successful digital portfolio that showcases the strength of your creative talents and technical skills. By the end of the course, you’ll have the confidence and skills to promote a polished personal brand. The order of the Global Makeup program modules that each student receives may vary due to instructor scheduling needs. Each student receives the exact same modules and total amount of training but the order of some modules may vary for certain groups. For example, some groups may receive the Resumé module in the middle of the program, others may have this scheduled at the end of their program. The college reserves the right to change course offerings, course content, kit contents, facilities, faculty, tuition fees, and course schedules without notice. ​Must be high school graduate or 19 years of age or older at the start of the student’s program of study.